Of course everyone thinks of Bose when they think of wireless noise cancelling headphones, but $350 is a tall order for many people regardless of how great Bose’s QC35s are. Sony’s latest wireless noise cancelling headphones are somehow even better, but they’ll cost you the same $350. 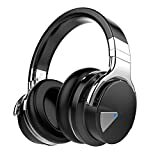 While it goes without saying that the COWIN E7 Wireless Active Noise Cancelling Headphones aren’t quite in the same league as the QC35s or Sony’s WH1000XM3 headphones, you’ll be positively shocked at how well they perform for just $60. Wait, did we say $60? Clip the $10 coupon on Amazon today and you’ll only pay $49.99!